Hello, my dear friends! Another day before spring truly arrives, the bright sunshine is kind of deceiving. As soon as we head into March, I began to resist wearing heavy coats but layers are still very much needed to keep warm. As a result, I turn to pieces that are sleek yet still warm enough, in other words, anything wool and wool crepe. The outfit today is a direct result of that train of thought. If you've been following me for a while, you know I love a good feminine detail in my outfits: ruffles, flares, lace, polka dots, and embroideries. When I saw this cape blazer during Nordstrom designer sale, I knew it had a space in my closet. 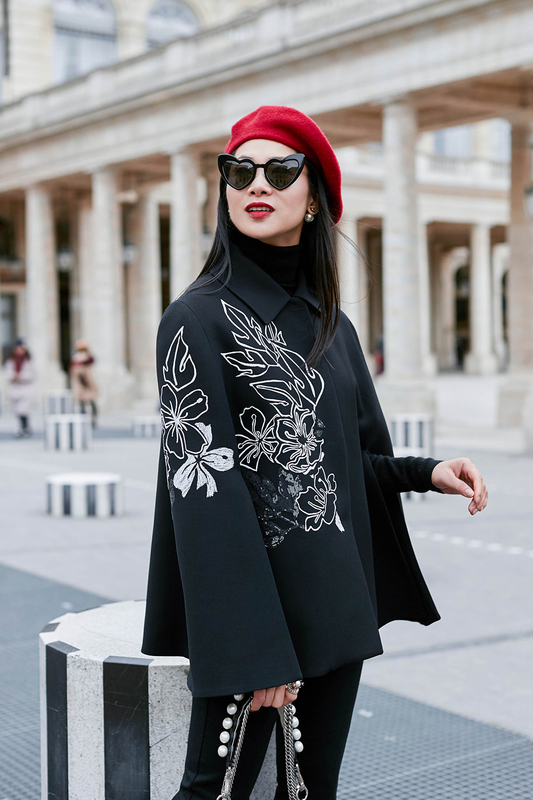 The cape style is timeless and the color black is timeless, and the beaded embroideries are elegant enough to be classy rather than flashy. With any outfit, I am always looking for some off-setting masculine factor, can you guess what is that with today's look?...Hehe, yes, the ankle boots. They took the shape of men's footwear and the heels of cowboy boots, but the white star in front makes them distinctly woman. Cowboy boots like this, as I've mentioned in my latest trend analysis, will be a big hit for footwear in 2018. Thank you so much for reading! I hope you like this no-so-basic all black look and inspired to create your own.